A piece of fruit, typically an orange or apple, studded with cloves and hung in a closet by a ribbon for a similar purpose. 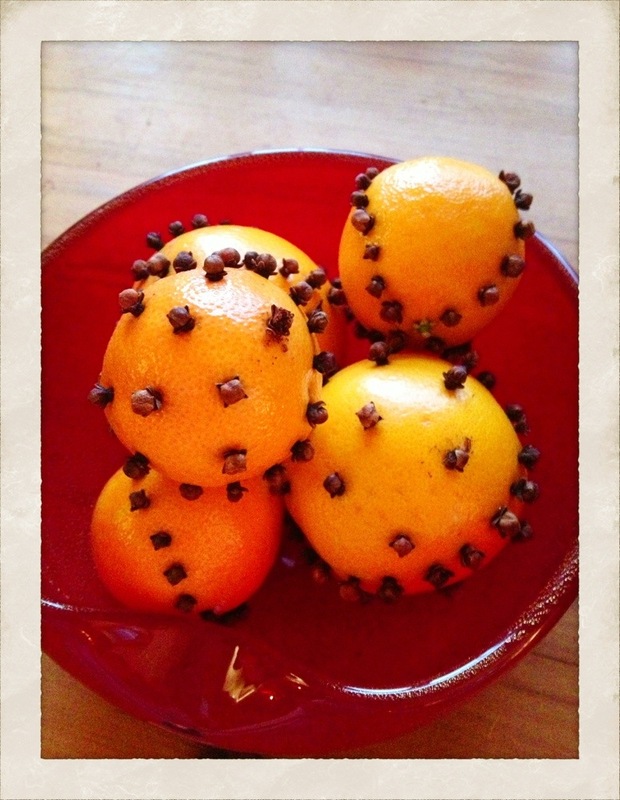 I associate pomanders with the holidays and making them as a kid in school as well as with my grandmother. I think of them more as decorative and love them in a bowl on the dining table during the month of December. It was my quick project yesterday. Takes no time at all. Find fairly thin skinned oranges as it will make pushing in the cloves so much easier. Trust me on this one. Your fingers will thank me later. Do whatever pattern you like. There is no right or wrong with how you place the cloves, just do it in a fashion that pleases your eye. Try holding the clove towards the stem when you are pushing it in, as it is then less likely you will break off the little bulb on the top of the stem. They look best when these stay intact. 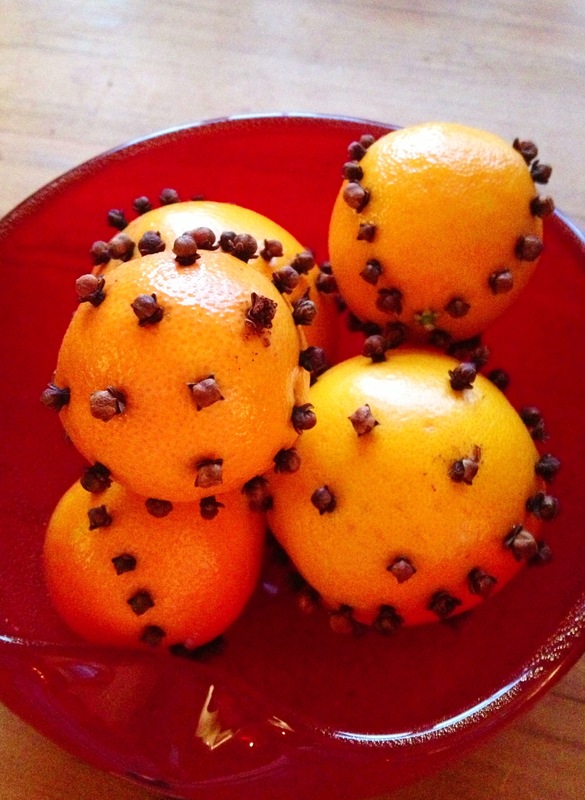 The oil from the skin of the orange will mix with the oil on the clove for one seriously yummy scent. 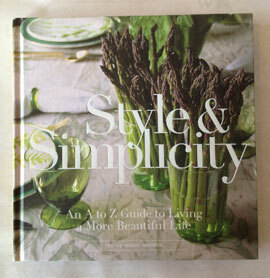 It makes a great decorative object or little gift. Have fun and happy December! These take me back to my youth. I was so fortunate as a little kid to go to a school that really embraced the arts and creative classes. One of my teachers was French and she had us make these during the Holiday season. I can still somewhat imagine the sting on my thumb from pushing in the cloves to the oranges. But it was so worth it, as starting young, I derived so much pleasure in giving them as gifts and seeing how happy the recipient would be. Same holds very true today. Really just the simplest of things to do. 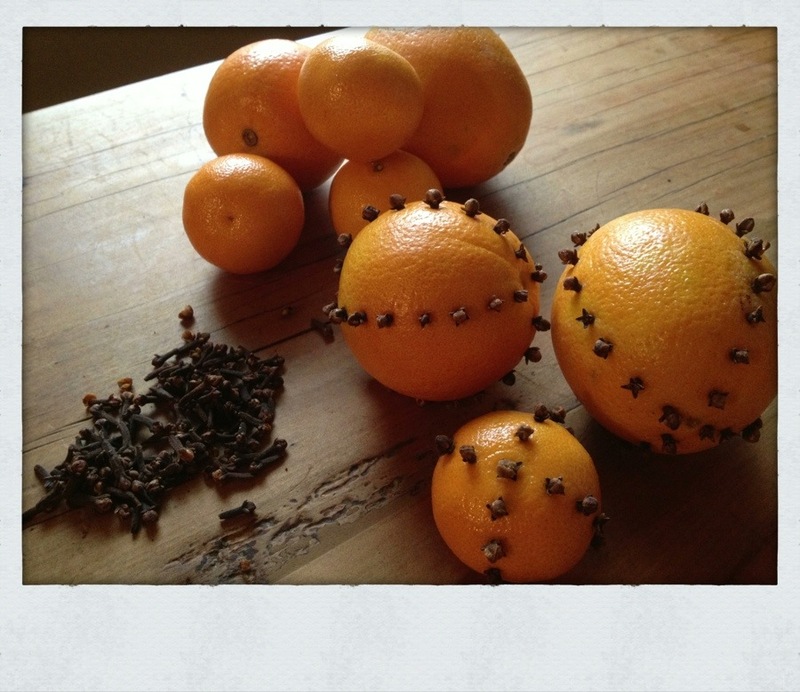 Just push in cloves in a pleasing pattern to an orange. You will immediately be taken with that intoxicating aroma the two make. Use as many or as few cloves as you would like. Doing them the other day I used 3 different types/sizes or oranges, as I really liked the visual variety. The living room smells divine. Great to give as little gifts or keep for yourself as a treat.